American photographer Charles Clyde Ebbets was born in Gadsden, Alabama in 1905. He started out as a photographer in his 20s, then became an actor, pilot, automobile racer and wrestler, whilst simultaneously shooting pictures on a freelance basis. By the 1930s Ebbets had been published in major newspapers across the US, and in 1932 he was appointed photographic director for the construction of the Rockefeller Centre in Manhattan. 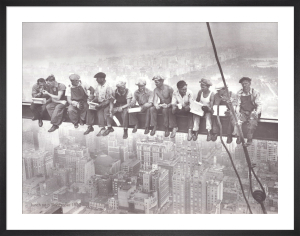 Here Ebbets captured the photograph of his career: 'Lunch Atop a Skyscraper' - a gravity-defying image of eleven men perched on a girder having lunch, feet dangling precariously, hundreds of feet above the busy New York streets. 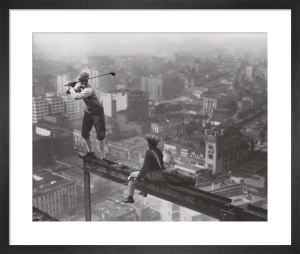 Initially appearing in the New York Herald Tribune, the photograph was taken on the 69th floor of the construction site!